But I think that’s because it’s mine and mine alone. If one of my children had diabetes, I’d hate it seventeen different ways. The responses from people on Facebook were so diverse, just like our community. And I think responses could also change depending on what’s going on in the world, in their lives that day, or what result might have just stared back at them from a glucose meter. No “right way” to feel. Whatever way you feel is right. Diabetes is part of every day, and the emotional influence is has on our lives is rarely discussed but nonetheless pervasive and constant. But I’m glad we’re starting to talk about it. No matter how we feel about diabetes on any given day, the community that’s bloomed around this disease continues to inform, inspire, and redefine living with diabetes. That’s something worth loving. Diabetes Blog Week: Language and Diabetes. Perspectives on Diabetes: Why Children with Diabetes Matters. Diabetes Blog Week: Message Monday. 5 Worst Things to Consume If You Have Diabetes. Kind of like wondering what it would have been like to be born rich, instead of charming haha !! Kerri, thank u for taking the time to seek out answers from others about this emotional side of living w T1D. 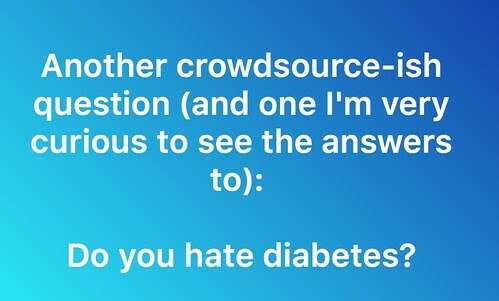 Diabetes is the annoying relative that won’t ever shut up and acts out at the most inopportune moment. Most of the time I just roll my eyes at him. I definitely think that diabetes is forever going to sit at the children’s table at Thanksgiving and will eventually be sitting there alone. I always hated my diabestes until I was diagnosed with MS. It changed my outlook on my diabetes and now it doesn’t seem that it’s bad. I’m going to post my hate for it’s pain, inconvenience, and in your face kind of challenges on behalf of my sweet brown girl who would NEVER use the word ‘hate’.